I've been in a clothing rut lately — swapping between the same clothes over & over until they literally fall apart. I finally set aside some time to shop & browse through the endless sea of clothing racks. After a bit of tedious riffling, I found some new items to keep the pep in my step. It's exhilarating to find something fresh to add to my wardrobe, especially it's been so long since I've done so! When Fred & I took a 24 hour trip to La Jolla, I figured it was the prime time to sport my new attire. We've been exploring nearby cities recently — Temecula & San Clemente. It's a fun way to discover Southern California without having to go too far. La Jolla is an affluent city, so the lovely & large gated houses are easy on the eyes. We were walking around in the early afternoon, taking everything in. We had no end game or desired destination. It was all about staying in the moment & seeing what we could find. We explored the downtown shopping area & I remembered a bakery my family used to go to when I was a kid, Gerard Gourmet. Fred & I sat on the patio for cup of coffee & split a carrot cake muffin. We also bought a mini strawberry rhubarb pie to go. We ate it later that night & it was delightful. After a bit of digesting & more aimless exploration, Fred spotted this multi colored tile mural — titled Favorite Color by Roy McMakin. We were obviously attracted to it & beelined directly toward the rainbow-esque wall. La Jolla has many murals freckled throughout the city; we spotted several during our afternoon stroll. 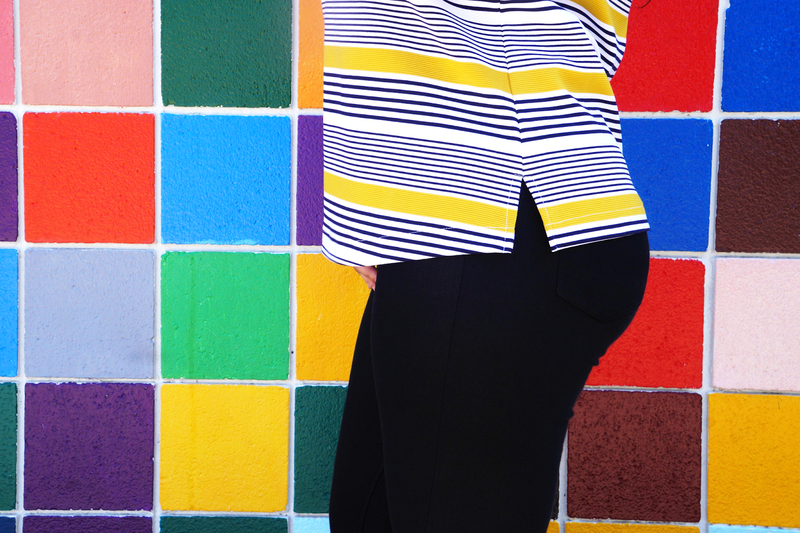 The bright colors lured us in. It was the perfect backdrop to highlight my new shirt & shoes. I ended up getting two variations of the flats: Ambrosia Apple (red) & Pasture Present (olive green). Hey, when you like something sometimes you just have to buy two. While we were there, a grandma & her little granddaughter dressed as Elsa took some pictures too. At least two people had their outfit of the day photos in front of this mural! That has to be a good sign, right? From the adorable baby seals at Children's Pool Beach to the mini strawberry rhubarb pie at Girard Gourmet, we had a great day in La Jolla. It ignited my everlasting infatuation with wanderlust. I'm counting down the moments until our next adventure — wherever that maybe. 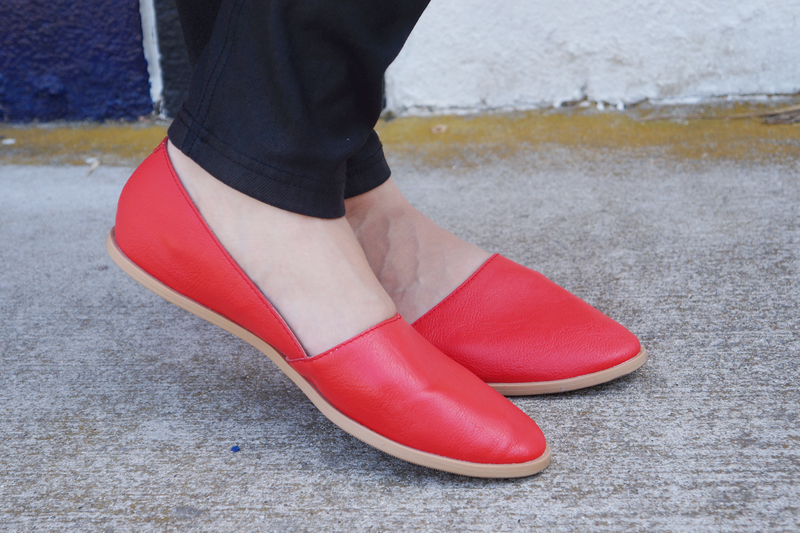 Love your flats! I'm on the hunt for some new ones so I'll definitely have to check out old navy! I honestly would never have thought Old Navy had such good stuff haha! Love the colour contrast of the shoes & bag against the t-shirt, looks great!! Ahh I love La Jolla!! I live nearby so have always made short weekend trips there with the family growing up and just love taking some beach-y sites in and eating some good food :) It's always nice to find some "new" clothes in the closet you look great! what a fun wall!! 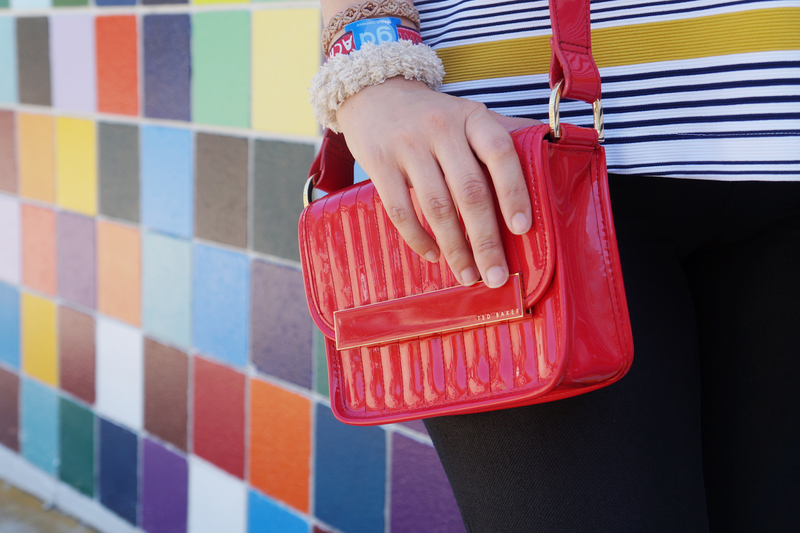 :D love the pop of color from your bag and shoes! You are looking so beautiful dear, amazing color combine! Stumbled across your blog and happy I did! LOVE the color in your clothing and accessories. So bold! 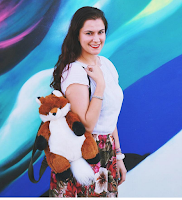 The mural is such great background for your new finds, Carmen. I'm loving the colour that's going on, and ah, a strawberry rhubarb pie sounds perfect right about now! 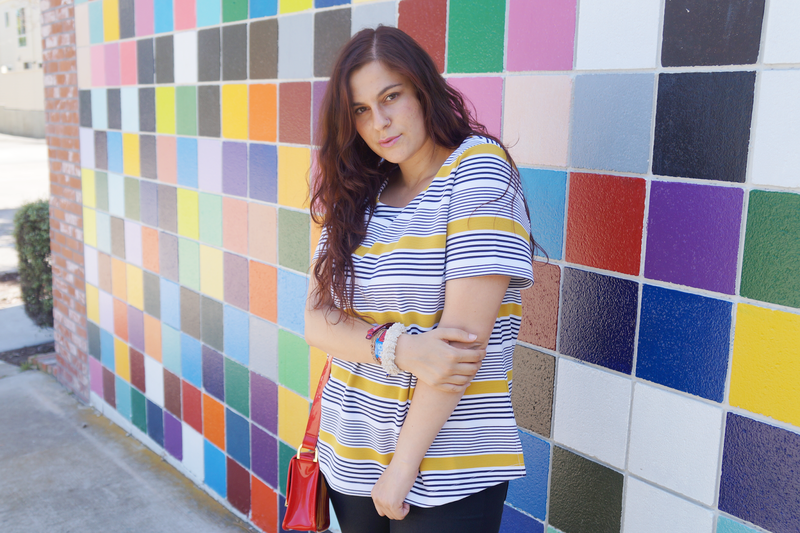 You can never go wrong with stripes - looks fab! That backdrop is so much fun! I love all the colors, awesome pictures!! Looks like a nice time :) I love the poppy red flats -- are they comfortable after having worn them all day? Love that top! So cute with the coordinated red accessories!! Great outfit! Really like the pop of color! Soooo gorgeous. From the tips of your toes to the top of your head you are literally glowing! I love the colours in this outfit. And I also love your hair. OOF You're really making me regret cutting mine short now! Such cute pops in your shoes & bag! Love that wall too - so fun! such a nice wall!! You fit perfectly with your red shoes and bag. 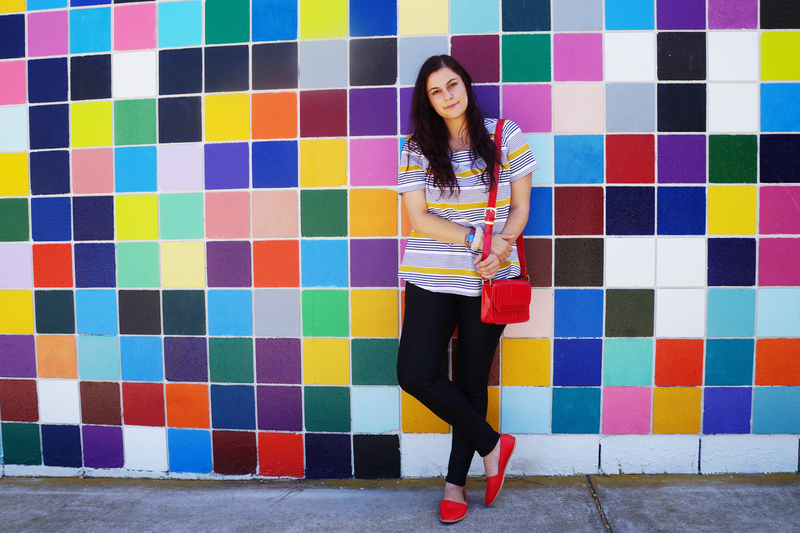 Great casual look and photos Carmen :) This wall is a great background for blogging photos!